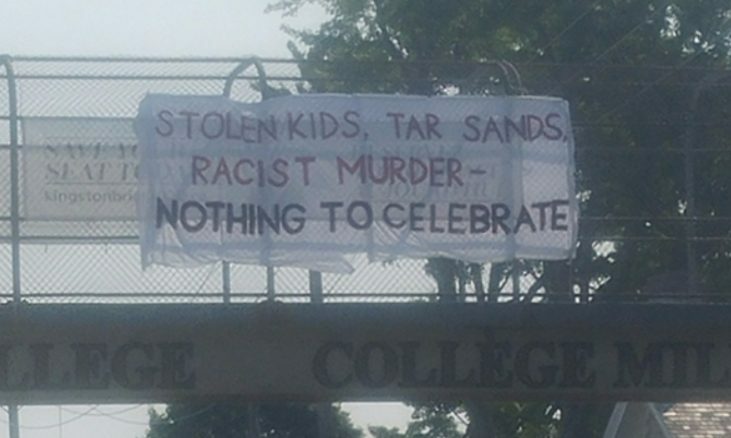 This morning we dropped a banner over Highway 2 from the Royal Military College bridge reading “Stolen Kids, Tar Sands, Racist Murder – Nothing To Celebrate”. This was both a response to a call from Six Nations to mourn the death of Jon Styres and as part of an ongoing tradition of resistance to Canadian nationalism here in Kingston. Thanks for sharing that! North Shore is just a platform for groups and individuals to submit content, we don’t report on stuff. If you wanted to write something about the action, or find and submit a reportback already posted elsewhere, we would definitely publish it!